Gertrude Lintz. 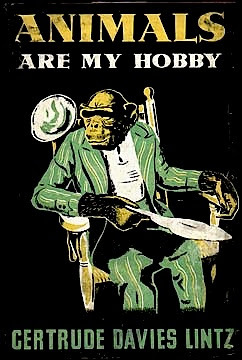 ANIMALS ARE MY HOBBY. Robert M. McBride Co, NY 1942. VALUE? One of those books it would be nice to find at a car boot sale for nada or less. It is obviously quite scarce and hard to buy for less than a £100 note - Ebay is recommended for the patient Gorilla punter on a budget. Early last year a copy of the US 1942 first in a chipped jacket failed to attract interest at $349 as a Buy-it-Now (or Bin-it -Now as one wag called it.) At the time I thought this indicated that the book in a genteel decline but a recent look at Addall shows the Museum Press 1945 paperback at over $350, one stray good+ McBride first at a similar price and 3 dealers holding out for $750 + (one signed). Meanwhile it is likely that copies are quickly sold at more modest prices and the above copies stick around like hardy perennials. Our photo is not from the first edition, the McBride first is red with an orange jacket with an ape--looks like a hard to sell nature book of the kind done later by Armand Denis etc., Below is a German poster for them movie which as well as the russet Rene also featured 'Cracker' himself - Robbie Coltrane. Kenneth Grahame. The Wind in the Willows, 1908. Sitwell and Blunt. Great Flower Books, 1956. The Seven Deadly Sins, 1962. B.S. Johnson. The Unfortunates. 1969.